work with Moscow fusion band “Syncopated Silence” and post-punk band “Motherfathers”) is one of the latest projects of Alexei Borisov, a veteran of Russian industrial / electronic / free improvisation scene. 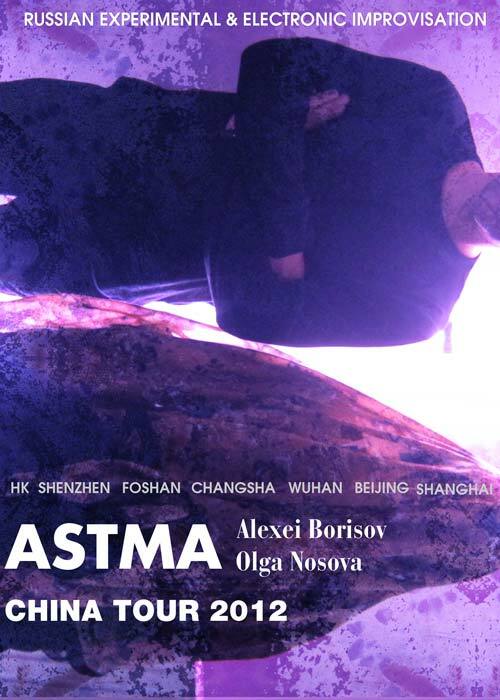 ASTMA’s music is noticeably very fast-developing – their mind-boggling and powerful music is already highly acclaimed among the music lovers not only in Russia, but around the world! The collaborative project was formed in April 2009 in Moscow. Paying homage to both experimental tradition of Alexei’s countless musical reincarnations and Olga’s instrumental experience, the duo embraces elements of weird free-form spoken word psychedelia, live electronics, minimalism, free jazz, noise, heavy acid, electroacoustic, dub and far too many different types of acoustic torture to even bother mentioning all of them! The music is highly improvised, so naturally Borisov / Nosova is collaborating with various musicians, video-artists, dancers, performers and poets from different countries, both in live situations and in studio environment: Anton Nikkila (Finland), Dave Phillips (Switzerland), Matthieu Werchowski (France), Dora Bleu (Canada), Thomas Buckner (USA), Tom Smith (USA), Jandek (USA), Anton Mobin (France), a_spirale (Italy), Ilya Belorukov (Russia), Sergei Letov (Russia), Korhan Erel (Turkey),Oleg Kornev (Russia/France), VTOL (Russia), Mitya Fedotenko (France), Alessandro Bosetti (Italy) to name just a few. This entry was posted on Saturday, January 28th, 2012 at 15:00. You can follow any responses to this entry through the RSS 2.0 feed. Both comments and pings are currently closed.